Again browsing through my old photographs, I found yet another fascinating creation of nature. Those who have read my previous post must have understood what I mean. Nature will take over everything if we still give it a chance to recover. 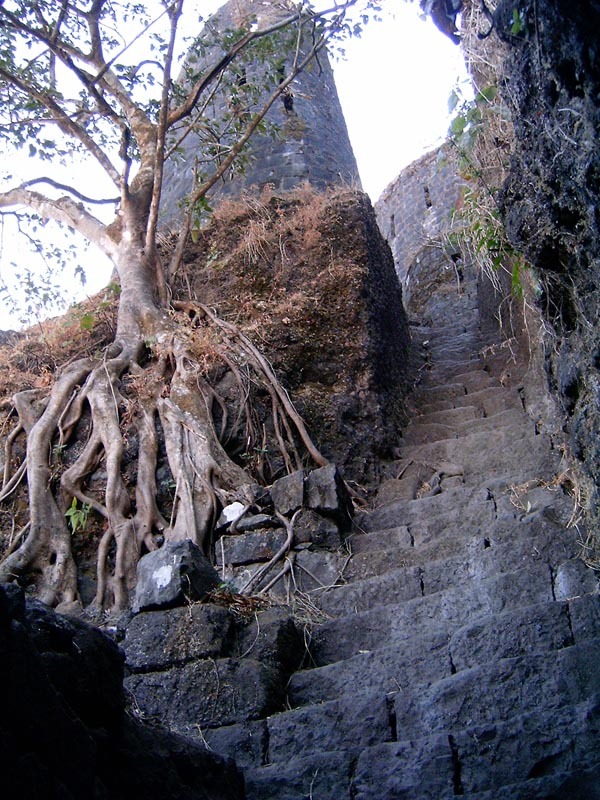 Below tree photograph is an example showing an old man-made structure being taken over by the natural process of vegetation. This photo is from the remains of the Tikona [triangular] [तिकोणा in local language] fort in Pune district of Maharashtra state in the country named India on the third planet named Earth in the local solar system. Yes, nature takes it back, unless we go too far in our "destruction" work! That tree is fascinating the way it is bare rooted but still growing. That is something to see. Their is a vine in Georgia, especially out in the country that overtakes everything in its path. It has even collapsed old buildings. Bhavesh! I love that picture! I love the steps and the wall. Looks very haunting! That tree is amazing too! I agree with Donna Maria..there is definately something foreboding in the picture. Natures way of saying Keep Out. hmmmm....and i see the tree as holding it all together literally - holding the earth and stone together with its long fingers so that all can survive! Suerly it is the beautiful photograph. The roots seems to be huge hands. Isnt it. Amazing that the roots all seem to be above ground. Beautiful photo. And so true that nature takes over everything in time. The roots are fascinating, almost look like they oozed out of the trunk. I would love to climb up those steps and see what's up there. nature will live on long after we are gone. The root of this tree will one day make the steps crumble. Beautiful, nature is beautiful! Bhavesh, that's well noticed and beautifully photographed. Its amazing how that tree is perched so precariously. The tree is beautifully suspended, it has just stopped there for a bit, before taking off again and going to other places. Your photograph captured it all, congratulations Bhavesh, this is a unique photograph. Fascinating. I wondered how it gets adequate nutrients and water with so much of the root system exposed, and then I realized it sprawls like that to sink the roots down into soil at a distance.